The Supportive Living Program at PLACES provides case management and life skills training for adults diagnosed with mental health disorders who are living in homes or apartments or who have been homeless. Adults diagnosed with mental health disorders who are living in homes or apartments throughout Montgomery County. Although these individuals have severe and persistent mental illness, they are able to live independently in the community. PLACES is ideally suited to serve these individuals, who are similar to those in the Residential Adult Care Facilities but require less intensive services. 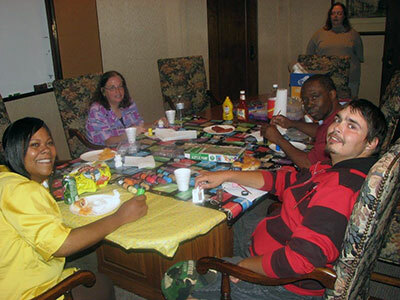 In fact, individuals sometimes transition from the Residential Adult Care Facilities to the Supportive Living Program. Adults who have been homeless. These recently housed, formerly homeless individuals have serious mental health issues. Since they are transitioning from the shelters or the streets into housing, they may receive limited funds for startup furniture, household supplies and debt resolution to remove the final barriers to housing. These individuals typically require Supportive Living Program services for less time compared to individuals in the first population. Adults with mental health disorders who are able to live on their own often need support to improve their skills and maintain their independence. PLACES provides case management and life skills training to approximately 200 Supportive Living Program clients throughout the year. Our services empower these individuals to learn new skills and accept more responsibility so they can maintain their housing, avoid homelessness and improve their quality of life. All clients have access to the social and recreational activities PLACES provides. Based on their individual needs, clients can be seen as often as necessary. PLACES staff members are trained to recognize problems early so clients can receive the appropriate interventions before a physical, social or behavioral issue becomes critical. The goal is to help clients develop their community living skills so they no longer need intensive assistance. Some clients develop these skills quickly; others require more time before they can graduate from the program. Each year 30 to 40 individuals reach their goals and graduate. 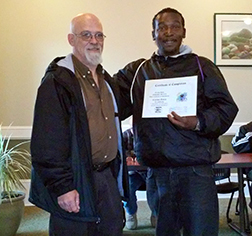 PLACES celebrates these accomplishments at our annual Recognition Reception in February. Supportive Living Program clients can choose from many activities scheduled throughout the month – everything from exercise classes, movies, shopping, bowling, mall walking and card clubs, to visits to local parks, historical venues, museums, libraries, the YMCA and ice cream shops. Clients are asked to contact their Supportive Living Program case manager by the fifth of every month to sign up for activities. Check out the current Supportive Living Program Activities Calendar.